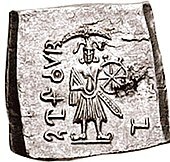 "Vāsudeva" redirects here. 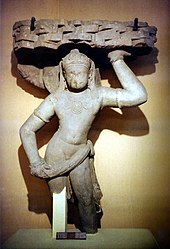 For the father of Krishna, see Vasudeva. 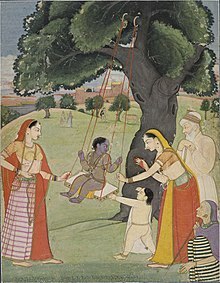 For Vaishnavism, see Krishna Vasudeva. This article is about the Hindu deity. For other uses, see Krishna (disambiguation). 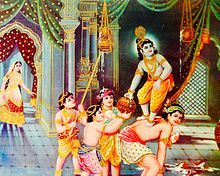 ^ a b Vithoba is not only viewed as a form of Krishna. He is also by some considered that of Vishnu, Shiva and Gautama Buddha according to various traditions. See: Kelkar, Ashok R. (2001) . "Sri-Vitthal: Ek Mahasamanvay (Marathi) by R. C. Dhere". Encyclopaedia of Indian literature. 5. Sahitya Akademi. p. 4179. ISBN 9788126012213. Retrieved 2008-09-20. and Mokashi, Digambar Balkrishna; Engblom, Philip C. (1987). Palkhi: a pilgrimage to Pandharpur — translated from the Marathi book Pālakhī by Philip C. Engblom. Albany: State University of New York Press. p. 35. ISBN 978-0-88706-461-6. ^ Wendy Doniger (2008). 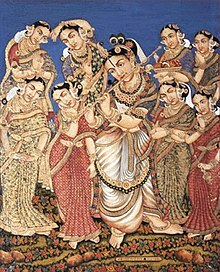 "Britannica: Mahabharata". encyclopedia. Encyclopædia Britannica Online. Retrieved 2008-10-13. ^ Gopal, Madan (1990). K.S. Gautam, ed. India through the ages. Publication Division, Ministry of Information and Broadcasting, Government of India. p. 73. ^ Gregory Bailey (2003). Arvind Sharma, ed. The Study of Hinduism. University of South Carolina Press. pp. 141–142. ISBN 978-1-57003-449-7. 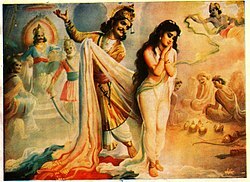 ^ "Yashoda and Krishna". Metmuseum.org. 2011-10-10. Archived from the original on 13 October 2008. Retrieved 2011-10-23. ^ "Krishna Rajamannar with His Wives, Rukmini and Satyabhama, and His Mount, Garuda | LACMA Collections". collections.lacma.org. Retrieved 2014-09-23. ^ "Home". Jai Baba Mohan Ram Ki. Retrieved 2019-04-15. ^ William R. Pinch (1996). "Soldier Monks and Militant Sadhus". In David Ludden. Contesting the Nation. University of Pennsylvania Press. pp. 148–150. ISBN 9780812215854. ^ "Thiruppavai". Ibiblio. Retrieved 2013-05-24. ^ Desika, Vedanta. 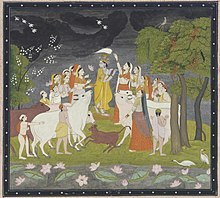 "Gopala Vimshati". Ibiblio, Sripedia. Retrieved 2013-05-23. ^ Subhadradis Diskul (M.C. ); Jean Boisselier (1997). Natasha Eilenberg; Robert L. Brown, eds. Living a life in accord with Dhamma: papers in honor of professor Jean Boisselier on his eightieth birthday. Silpakorn University. pp. 191–204. ^ "Andhakavenhu Puttaa". www.vipassana.info. Retrieved 2008-06-15. Ekstrand, Maria (2004). Bryant, Edwin H., ed. The Hare Krishna movement: the postcharismatic fate of a religious transplant. New York: Columbia University Press. ISBN 978-0-231-12256-6. Gaurangapada, Swami. "Sixty-four qualities of Sri Krishna". 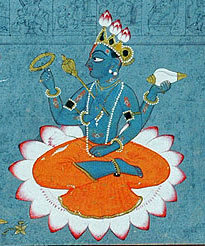 Nitaaiveda. Nitaiiveda. Retrieved 2013-05-24. This page was last edited on 17 April 2019, at 01:28 (UTC).